Now that you’ve set up your photography studio, figured out a naming convention and have decided on your camera of choice, let’s talk about light –– and how to use it to get the best possible product images. Shaping light is a vital photography skill. I say “shape” for a reason: improving lighting doesn’t simply mean adding more wattage. It means selecting the right equipment and positioning for your product, budget and studio space. Your needs will be different if you’re exclusively shooting still products in studio versus apparel on models in motion outdoors. How you handle safety concerns. Keep those specifics in mind as we break down broader divisions. What are the three main types of photography lights? Looking for a Place to Purchase Your Lights? Check out Precision Camera located in Austin, Texas. It is the largest camera store between New York and LA. Continuous lighting works the way it sounds: your light stays on, continuously, as opposed to the powerful pulses of strobe speedlights and monolights. Continuous lighting is not as powerful as strobe lighting, but it’s good for beginners because what you see is what you get. That makes it much easier to adjust lighting as necessary, and it’s also generally cheaper. It’s most useful for still photography and video, which suits product photography well. You may also choose to use it with models for eye comfort. Continuous lighting kits are good for beginners. Continuous lighting is good for beginners because you can see how light will affect your image before shooting, which makes adjustments easier. It’s also cost-effective compared to other lighting kits. The choice between bulb types is mostly a matter of personal preference, as each has pros and cons. Tungsten bulbs emit the most light in the broadest spectrum, but they also emit an uncomfortable or even dangerous amount of heat and use the most power. LED bulbs are easy and fast to set up, but because they’re newer there aren’t as many accessories available. Fluorescent tends to be the most common bulb in use in studio lighting; they’re safer and more energy efficient than tungsten, they have lots of modifiers like softboxes available, and there’s no need for the portability of LED. Whatever bulb you select, set your camera’s white balance accordingly and use a grey card to ensure your colors are captured as accurately as possible. You can give yourself even more control over your light if you look for adjustable power options. Variable power may save you time and help you take better photographs by letting you adjust your light more subtly and quickly than removing bulbs. Some multi-socket kits will let you toggle select bulbs on and off to control your power. 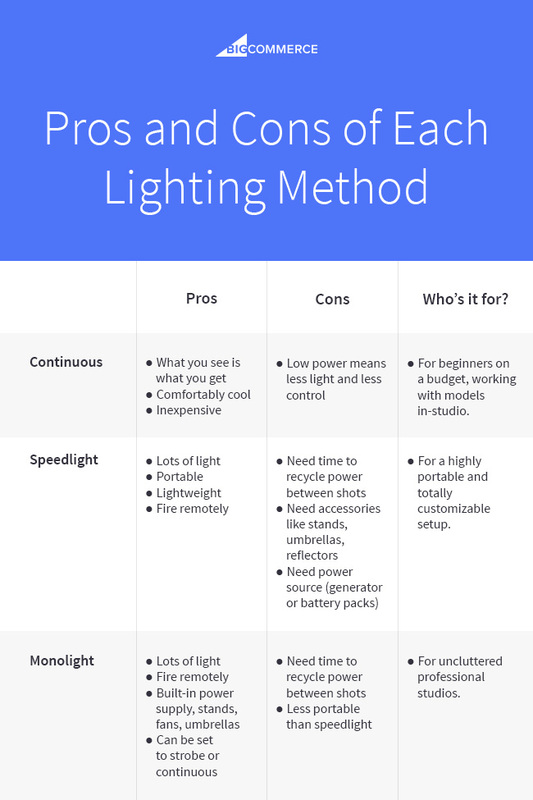 Continuous lighting has its uses, like for beginners and video as we’ve discussed, but they are not as popular as strobe lighting options. Strobes simply produce more power, and they pack it all into a very brief moment of time, allowing you to overpower other light sources (like the sun) and completely control your light. 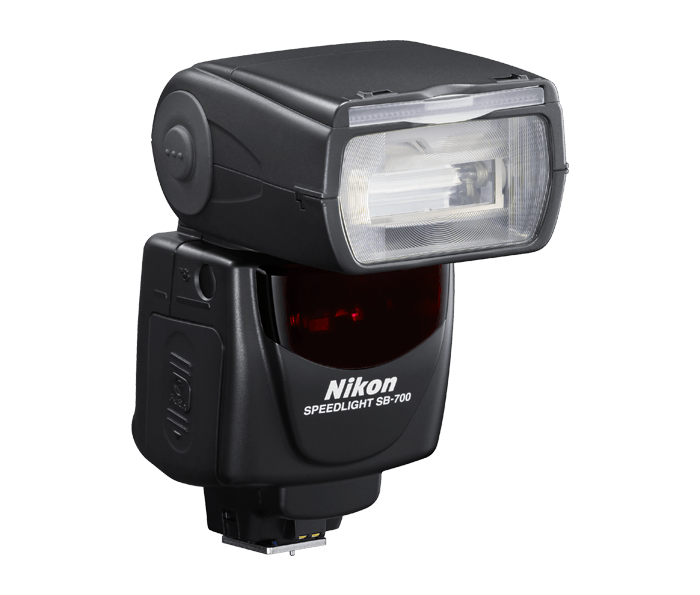 Speedlights (or “speedlite”) are external flash units also known as an “on-camera flash.” Despite the name, they don’t have to be attached to your camera (although they often are). 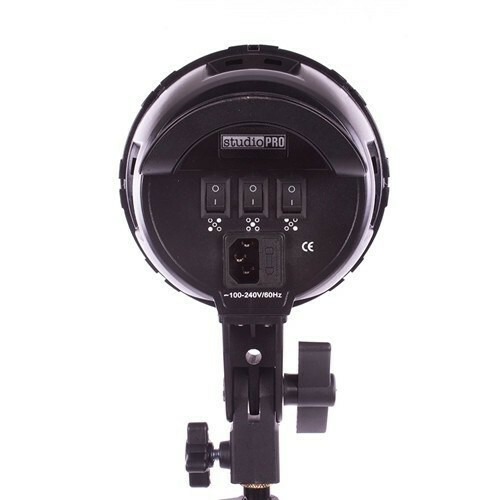 Because speedlights are strobes, they produce an immense amount of light in an instant and then need several seconds to recycle before firing again. That can be frustrating for beginners, who may have several false starts before getting the lighting just right. 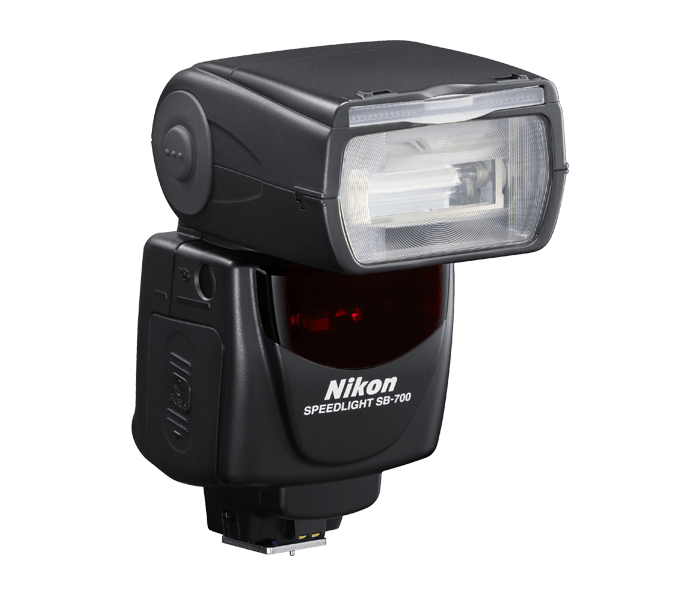 For confident photographers, or photographers on the go, the power and flexibility of speedlights is well worth the wait. The increased light allows more varied aperture and ISO settings in a wider variety of environments. Speedlights are faster and more powerful than your camera’s built-in flash, and they can be used with umbrellas and softboxes to create dispersed light. They’re lightweight, portable and lend themselves well to action shots and location photography. If you’re taking the speedlight approach, you’ll need to purchase both a speedlight and an accessories kit. You can fire flashes from your camera or remotely, which leads into the next step of assembling your speedlight kit. 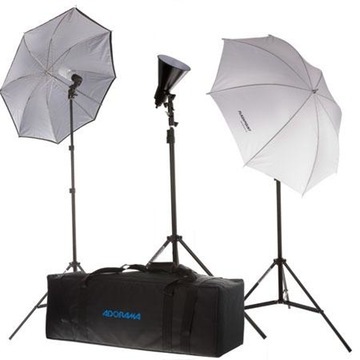 You can buy light stands and softboxes without lamps to use with your speedlight. 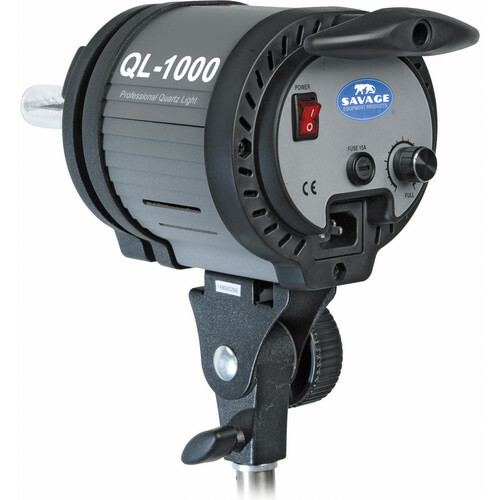 Monolights are tidy self-contained units with their own power supply and more. The primary advantage of a monolight is that the head of the lamp contains its own power source, so you don’t need an additional generator or power pack. It’s tidier, allows more positional flexibility and eliminates extension cables preventing power loss (estimated at about a ¼-stop of light each time you connect cable components). Monolights are studio favorites, but they can be used for location photography as many of them are quite compact. It’s helpful not to be dependent on a single power pack, so that if one light’s power supply is blown any others will still be operable. 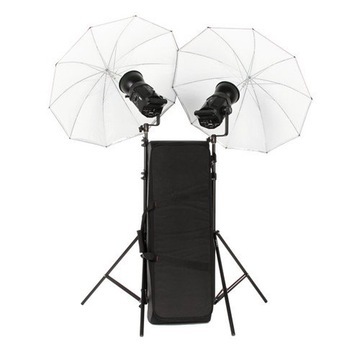 Strobe monolights are popular for model photography and product photography. They also usually come with a continuous lighting setting. 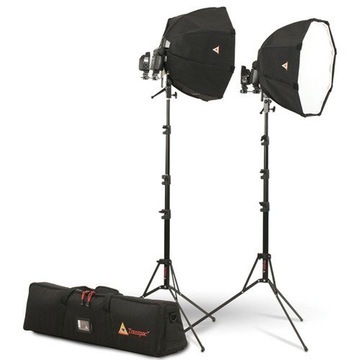 Whatever type of lighting kit you invest in, we recommend getting at least two sources to ensure you have ample light. The added versatility will allow you to be more creative and professional. Lighting is product specific: you’ll use a different arrangement for metallic objects than you will for apparel. Once you have your equipment, you need to know how to use it. With lighting, that largely means positioning. Take reflective products as an example: you might backlight clear or colored glass, while you sidelight detailed glass, and overhead light metal objects, but we’ll cover this more in depth in a subsequent chapter.